We were treated to all the psychological trauma Black Jack could summon, but we get NO CLAIRE THE EXCORIST?! C’mon, Starz! You didn’t shy away from one tough scene, how could you skip the whole ransoming the soul part? I’m not sure a few slaps really covers it, and I’m definitely not sure you deserved to use that episode title. Claire’s got a bun in already. Cause we all know a baby fixes things. 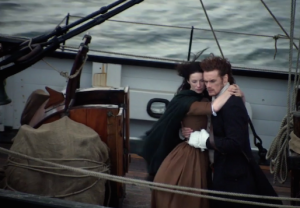 But are we tuning in early 2016 to see where Outlander takes us next? Absolutely.